6/1 Cup of Coffee: A dominant performance from Jalen Beeks (pictured, right) was the highlight of the night, while a moonshot from Bobby Dalbec wasn't too far behind. Last night may have signaled a role change for Travis Lakins, while Tanner Houck was hit hard again. 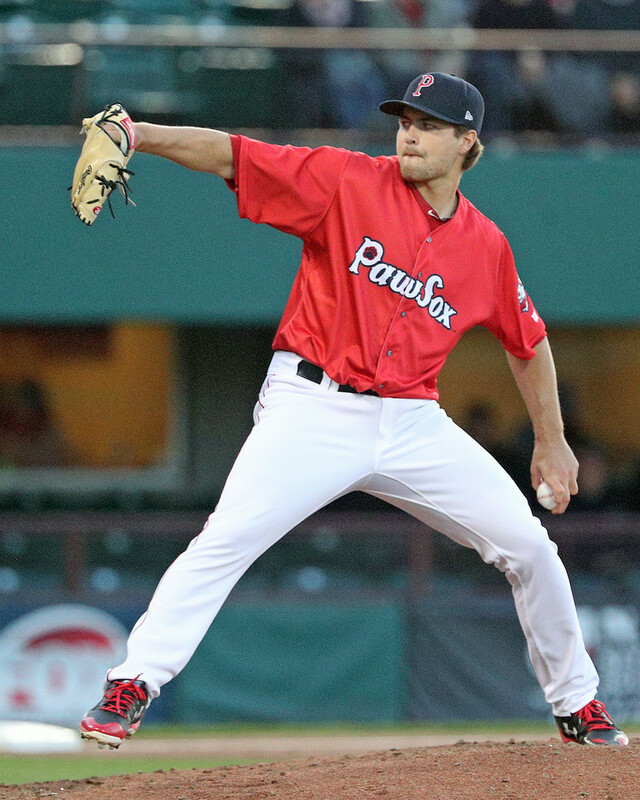 Jalen Beeks improved to 3-3 after tossing seven innings of one-run ball, and the PawSox held off a late Norfolk rally to take the victory. Beeks allowed only four hits and did not walk a batter while striking out seven. Williams Jerez picked up his fourth save, but did allow two runs in the ninth to make it interesting. The offense was led by Tzu-Wei Lin who homered in his second straight game as part of a 2-for-4 night. Mike Olt also extended his team lead in home runs with his seventh, a solo shot in the fifth inning. Portland scored 10 unanswered runs to shock the Fisher Cats. Down by five in the seventh, the Sea Dogs already pushed three runs across, and then Tate Matheny laced a two-run double to tie it up. Jeremy Rivera drove in four runs and went 3 for 6 with a double, Jhon Nunez went 3 for 5, and Danny Mars went 2 for 3 with a walk and scored three runs. New Hampshire's juggernaut offense got the better of Portland's pitching again, with Dedgar Jimenez surrendering five runs in four innings and Daniel McGrath following with two runs in two innings. Travis Lakins appeared in a one-inning relief role for the first time this season and struck out two in a scoreless frame. It will be interesting to follow his usage going forward as this could signal that he is being groomed for a role in Boston's bullpen this season. In the completion of Wednesday's suspended game Salem came out on top. It was 0-0 in the bottom of the third when the game was called, and Salem put up two in the fourth on Thursday. Darwinzon Hernandez tossed three scoreless innings on Wednesday and Daniel Gonzalez came through with three shutout innings on Thursday to move to 6-0. Bobby Dalbec added an RBI double and he came around to score on a Jordan Procyshen single. There was a lot more action in the second game of the day as the teams combined for 18 runs in seven innings. Tanner Houck's nightmare season continued as he was lit up for six runs on eight hits in only 3 2/3 innings as his ERA rose to 6.04. The recently-demoted Jake Cosart allowed two more runs in his inning of work, but Yankory Pimentel was able to put out the fire and hold the Nationals scoreless the rest of the way. The 12-hit attack was led by Roldani Baldwin who went 3 for 3 with a three-run home run. Dalbec also added a three-run home run as part of his 2-for-4 night and C.J. Chatham went 2 for 4 with an RBI. Four Greenville errors led to six unearned runs and a sloppy loss for the Drive. Jhonathan Diaz pitched well as he allowed two runs and struck out eight over five innings. The defense fell apart for Marcos Lantigua who allowed five unearned runs in only two innings of work. One of the errors was his own on a pick off attempt, and third baseman Everlouis Lozada committed three more on the night. The offense managed seven hits and Victor Acosta's solo home run was the biggest one of the bunch. Lorenzo Cedrola continued to hit the ball well going 2 for 5 to raise his average to .323. Player of the Night: He seems to be at least in contention for this award every time he pitches, and Thursday night was no different for Jalen Beeks. Beeks struck out seven over seven innings and allowed only one run as his ERA dropped to 2.56. It does not seem like a coincidence that Beeks is lined up with Drew Pomeranz, and after another rough start last night for Pomeranz it is at least a possibility that Beeks makes his next start in Boston. Beeks is already on the 40-man roster, and the fifth-ranked prospect in the system has earned a look with 80 strikeouts over 56 1/3 innings.